It’s all Ottolenghi, all the time round here at the moment. 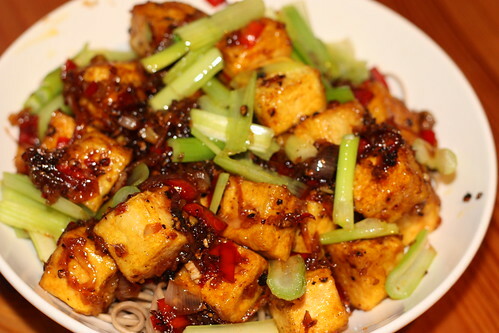 The black pepper tofu recipe seems to be near the top of everyone’s list to try from Plenty. The recipe was first published in the Guardian, so many people have tried it already. I happen to love tofu, so I was very keen to give it a go. I brought some black pepper back with me from Sri Lanka. It has quite a different flavour from the pepper I’m used to – almost earthy, and slightly smoky. It has a habit of overpowering any food I add it to, but I figured that since the recipe was called black pepper tofu, that wouldn’t exactly be a problem! I reduced the quantities of everything as I was only cooking for one. The recipe calls for eight red chillies. I used two very large red chillies. I think they were fairly mild, which is why I didn’t get the same chilli burn others seem to have experienced. They still added a pleasing warmth to the recipe, and the flavour of the black pepper definitely came through. I have a fairly high spice tolerance though, so I perhaps next time I make it I’ll use a flatmate as a control (they’re generally quite game for my kitchen experiments). I also didn’t have any sweet soy sauce, so I just added extra light soy sauce. Now that I know I love the recipe, sweet soy sauce is on the shopping list. Just writing about this recipe makes me want to go out and buy some more tofu. It tasted incredible. Because I’m lazy, I ate it with noodles, but it would have been even better with rice. Next time I make it, I might try it with regular black pepper, but I still have plenty from Sri Lanka too. 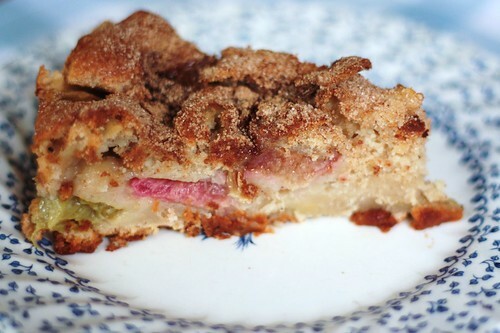 If you want to try it, the recipe is on the Guardian website here. This is a mammoth post but it may interest some of you – if not please skip past it! I’ve been thinking a lot lately about how I can live in a way that’s better for the environment and better for my health. There’s plenty of stuff I do already, but there’s always room for improvement. In terms of the environment, I want to use products that cause as little damage to the environment as possible. In terms of my health, I can’t escape the fact that I am getting older, and I just want to slow the process as much as possible! I have slightly high blood pressure (one nurse described it as “normal for a 45 year-old woman” but not normal for a woman my age) so I’d love to get that down a bit. I’d love to feel fit, have a bit more energy, and keep my skin looking nice. Obviously, I love food. I try to eat organic wherever possible because I believe it’s better for the planet and my health, and it generally tastes better too. I have a lot of fresh vegetables, and have recently been incorporating a bit more fresh fruit into my diet as well. I’m trying to eat more wholegrains, and I often choose wholegrain over white pasta, and incorporate wholegrains into the bread I bake. I want to eat more nuts, especially brazil nuts which are meant to be a real superfood. It would be good to start eating more of these “superfoods”, luckily they tend to be some of my favourite foods anyway – berries, garlic, tomatoes, avocadoes, and for a real treat dark chocolate and red wine. And apparently now even popcorn is a superfood! I adore popcorn, though I’m thinking I should probably cut back on the butter and salt. Ah yes, salt. I really love salt, but I should probably cut back a bit on account of the high blood pressure… sigh. I’ve also recently become slightly addicted to carrot juice. This happened when I bought the LEON cookbook and found the recipe for “Allegra’s Beautiful Juice”. I’d always struggled with the carrots in my veg box, so this seemed like a good solution. One of my old flatmates had left a juicer behind, so I dragged it out of the cupboard and gave it a go. The juice uses 400g organic carrots, a small piece of ginger, an orange and 120ml almond milk (which I buy from Planet Organic or Wholefoods, and almonds are of course another superfood). It’s absolutely delicious, and gives me a lot of energy. It’s also full of vitamins that are good for the skin. Something I also have to focus on is portion size. Since I usually just cook for myself, it can be easy to eat a bit too much. I think I should try to cook things that can be eaten as leftovers and taken to work for lunch the next day. So, action plan: keep doing what I’m doing, but watch portion size, cut back on salt, eat more superfoods especially nuts, take more packed lunches. I’ve been trying to go a lot more natural with the stuff I use on my skin. I’ve recently switched to using Dr Hauschka products. I have combination skin so I use the Clarifying Toner, Moisturising Day Cream, and the Normalising Day Oil. To cleanse, I use Lush’s Herbalism cleanser. I swear by this – my skin improved dramatically as soon as I started using it. The Dr Hauschka products don’t include any sunscreen. I have very pale skin that needs protection. I’m also allergic to the sun and tend to come out in a rash from overexposure (not a huge problem in the UK, but you should see me when I go on holiday!). One product I use on my face is Philosophy poreless, flawless spf 15 (much cheaper on eBay, by the way) which is a primer with sunscreen. It’s not the most natural product around but it does make my skin look incredible. Another product I love is MAC Mineralize Skinfinish. I don’t like to look like I’m wearing makeup but these two products manage to even out my skin tone with really low coverage. I’ve just bought some Liz Earle spf20 mineral sunscreen, so I’m going to give that a go and see how I get on. On my hair, I use Lush Seanik solid shampoo. I love how there’s no packaging, so it really is good for the environment. One bar lasts a long time. I haven’t found a decent conditioner yet, but I’ve managed to cut out “cones” (apparently any ingredients ending in -cone are bad news) and my hair still seems ok.
As for my body, I use a cheap body wash in a squeezy bottle. This has got to stop. Compared with the other lovely products I’m using on my skin, it just seems chemically and gross now. Luckily, I’ve just bought some Dr Bronner’s soap which should do for a lot of my house cleaning needs as well (see below). Once in a while I do a sugar scrub, which is just a few tablespoons of caster sugar, a tablespoon of sweet almond oil, and a few drops of whatever essential oils I feel like using. I have a good scrub with it in the shower, and it leaves my skin feeling really great. When I’m feeling a bit more flush I buy Lush’s Buffy body butter, amazing stuff and their best seller for a reason. Plan: Start using more natural products on my body and skin. Replace products (especially makeup) with natural products as I run out. Find a decent conditioner – any ideas? I have never been particularly fond of exercise. I have hypermobile joints, which can result in a lot of pain when I try to exercise, and made school sports an absolute nightmare. When I started university, I discovered salsa dancing and it became a regular habit for the next 8 years. It was fairly low-impact on my joints, it was fun, and it didn’t feel like exercise. When I moved to London I found a great teacher, but her classes are a bit expensive and since she moved they are now too far away. I’ve also never really enjoyed social dancing here, probably because I don’t have any friends here who are great dancers. As a woman I’m very much at the mercy of the guys leading me… and sometimes it’s just no fun! So the current exercise regimen involves hula hooping, Pilates, and – gasp – running. Hula hooping is incredible fun. I exercise best when I don’t notice it’s exercise… and it’s surprisingly good exercise. I go to classes run by Diana Defries up in Muswell Hill. I’ve just finished a 6-week beginner course and I can’t wait for the next course to start. I go to Pilates at The Hub in Regent’s Park. And running, well, both my flatmates run. It’s something I’ve never been able to do because of my gammy joints, but the good thing about hypermobility is it’s supposed to get better over time. Hoorah! One good thing about the ageing process. The wonders of modern technology have also brought me special magic running shoes designed for flat feet (oh yeah, I have those too). I don’t think they existed twenty years ago when I was struggling to do school cross countries. At any rate my hypermobility wasn’t even diagnosed until my late teens. I’m trying to be careful with the running. I can’t run very far yet and I don’t want to wreck my feet and knees. But I did the Race For Life on Wednesday and managed 3 of the 5kms. Plan: Keep hooping. Keep running if my body continues to cope with it. Keep going to Pilates. Exercise at least three days per week. Possibly pick up swing dancing again. I really want to move away from using chemicals that are harmful to the environment and potentially harmful to me. I’m allergic to pollen, dust mites and mould spores but I really don’t think my lungs like most household cleaning chemicals either. I currently do a lot of cleaning with microfibre cloths and water. I use a lot of vinegar too as it’s really good for getting rid of limescale. I cut up rags from old clothing and sheets and use these rather than paper towels to clean. I’ve also ordered some ecoballs for my washing, and a stainless steel toilet odour neutraliser. The toilet’s right next to my room, and I really can’t stand the smell of the artificial vanilla spray my flatmate uses! Plan: go all-natural with cleaning products. Make a yummy-smelling natural air freshener for the toilet! Well that was a long post. I hope to update soon to report on how all of my plans are going. I’d also love to know any ideas you all have. Breakfast Club is a new food blogging event hosted by Helen from Fuss Free Flavours and Sarah from fingers and toes. We love breakfast and want everyone to enjoy better and more interesting breakfasts. Each month one of us will choose a theme and then post the round up on the last Sunday of the month. We hope to get some prizes for future events. So the theme for Breakfast Club #1 is ASIAN! We hope there is lots of scope for ideas here, rice & vegetables, dal and curry, sushi, miso …. Deadline is 6pm on the 27th June. We look forward to reading your ideas. Mail the host for the month, this time it is Helen (Helen at fussfreeflavours dot com) with a link to your post, name of your blog and a photo (or link to your photo) by 6pm (UK time) on the last Sunday of the month. If you do not have a blog send a recipe and photo to the month’s host who will include it in the round up. Tell everyone – let’s inspire each other to make more interesting breakfasts! 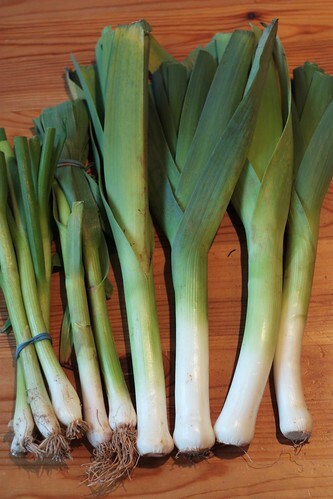 From left to right, we have spring onions, wet garlic, and leeks. The wet garlic was used first, as a substitute for shallots and garlic in some cauliflower fritters. I’ve written about the cauliflower fritters here before, I make them whenever I get a cauliflower in my box. The recipe is in the first Ottolenghi cookbook. And speaking of Ottolenghi, it was time to try another recipe from Plenty, with the remaining alliums. I wasn’t overly impressed with the first leek recipe I tried. I thought there was too much faff involved for a fairly average result. 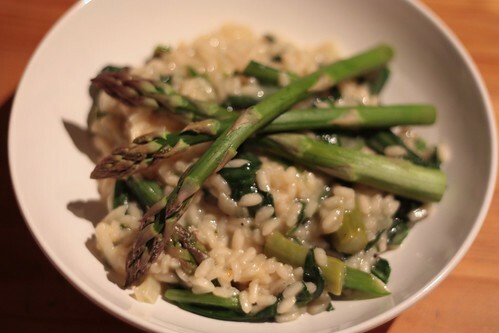 But this week, I had some more leeks, a spare red capsicum, and some spring onions, and there was another recipe in Plenty that used all three. It’s a three-part recipe, which Ottolenghi seems quite fond of; so again, the faff score is high. First, you pickle a finely sliced red capsicum in a mixture including cardamom, coriander, capers and pink peppercorns. Then you cook some leeks. While all of the vegetables are cooking, you make a sauce with some crème fraiche, olive oil, lemon, capers and spring onions. Then you egg and crumb the leeks and fry them. You assemble the parts together by placing a spoonful of sauce on top of a fried leek, then draping some pickled capsicums on top. There is no picture of how this is supposed to look in the book. Something I actually like about the book is that there is not much in the way of fancy photography. 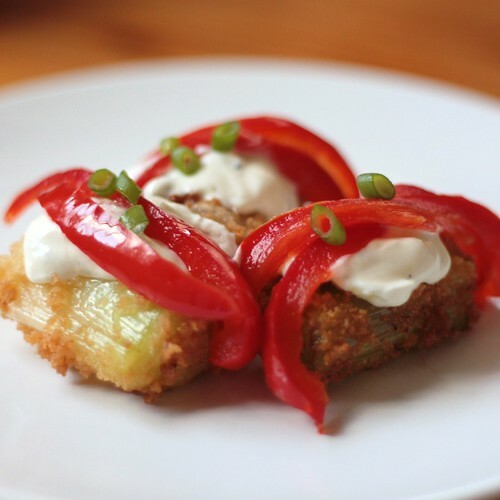 Many of the photos are “in progress” shots, and the picture for this recipe depicts a dish of pickled capsicums and some fried leeks draining on kitchen paper. However, the food in the photos is always so beautiful it doesn’t really need to be tarted up with pretty plates and fancy styling. It does mean that there’s no picture of the sauce in the book though. There was plenty of sauce left over but I’ve put it back in the fridge as it would make an excellent substitute for tartare. 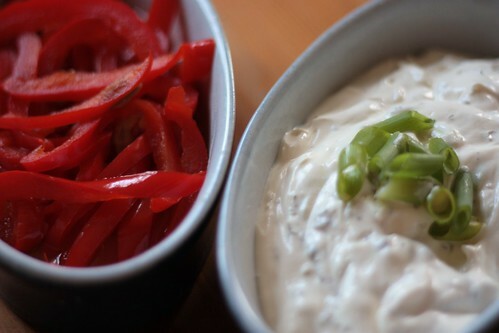 Speaking of which, there is a recipe for tartare sauce over at Fuss Free Flavours. She’s hosting Blogger Secret Ingredient this week and chose capers as the ingredient. I thought, since this recipe involves capers too, I would sneak this in as my entry! So after all that, what’s the verdict? I loved the leeks, the crunchy crumbs provided just the right texture. 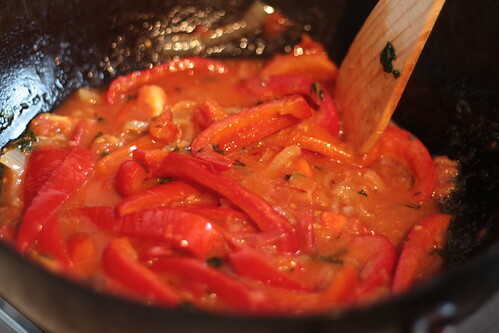 And the sauce and capsicum each went perfectly with the flavour of the leek. The capsicums would be great just as a dish on their own, I think. So the current score for Plenty is hits: 2, misses: 1. 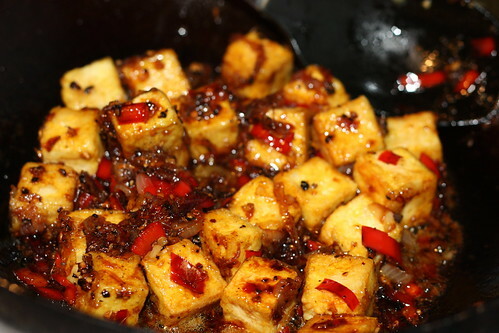 Coming up: black pepper tofu. Stay tuned! Shakshuka is a North African dish of eggs poached in a spicy tomato sauce. I first read about it over at Smitten Kitchen. I had tried making her eggs in tomato sauce, which were lovely on a bit of sourdough toast but not quite interesting enough to make again. Comments on that post led her to make shakshuka, which looked far more up my street. I put it on my list of things to try one day, and then Yotam Ottolenghi’s new book, Plenty, arrived with a recipe for shakshuka in it. If you read my last post on Plenty, you’ll recall that I was slightly disappointed by the leek fritter recipe. This really only stood out because it’s the first Ottolenghi recipe I’ve tried that hasn’t been completely mind-blowing. 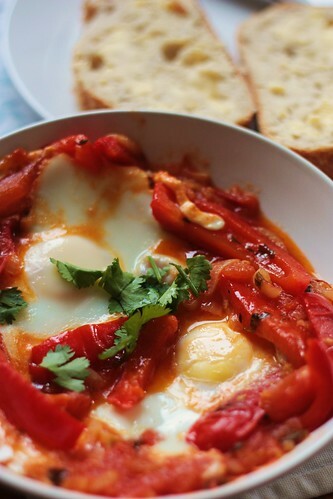 His recipe for shakshuka involves red and yellow peppers, tomatoes, onions, and various spices and seasonings. I received red peppers in my veg box this week so decided to give it a go, leaving out the yellow peppers and halving the recipe to feed two instead of four. The sauce can be made in advance, so all that remains is to put the eggs in, cover and cook for fifteen minutes. A sprinkle of coriander leaves – first harvest from my balcony – and it was ready to taste. What was the verdict? Absolutely delicious. We mopped up every last bit of sauce with our bread. The egg yolk came out set when I would have preferred runny, so perhaps I’ll shorten the cooking time next time. But there will definitely be a next time. Ottolenghi, all is forgiven! Oh, and if you want to try it, you don’t need to buy the book. The recipe is available on the Guardian website. And then you will buy the book. Oh yes you will.